Benga's revealed he deleted all his music while suffering with mental illness. The dubstep DJ premiered his new song Psychosis on Annie Mac's Radio 1 show, saying he's had a "crazy ride" with the disorder - which causes hallucinations. "It's been up and down for me. I went back into hospital, and I deleted my whole hard drive of music. Everything, gone," he said. The 31-year-old said creating the new song has helped him cope. The lyrics "paranoia, psychosis, voices in my head" are repeated in the track, over an intense electronic beat. "I'd been listening to a lot of weird, new electronic sound, and in five minutes it all kind of came together in this track," explained the musician, real name Adegbenga Adejumo. "I was talking all about how I was feeling and hearing when I was in psychosis, so it was perfect." Annie chose Paranoia as her Hottest Record in The World on Tuesday. 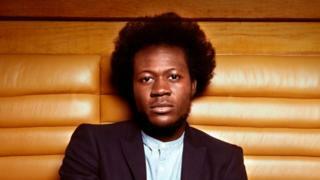 Benga told her: "I felt I owed it to my fans to be honest. You see so much of me out there doing crazy stuff and enjoying DJing, but I needed to show people that things can come unstuck." The Croydon artist announced his retirement in 2014, before revealing the next year that he'd been suffering with bipolar disorder and schizophrenia. In a series of tweets at the time, he said the problems had been "brought on by drugs" and "excessive touring". He told Annie: "I feel like [music's] my only way to recover. It's almost like meditating when I sit down and write music. "I pen little stories, so I go back and look at the stories, when I sit down and write music it all comes out. That feeling of release." After coming out of hospital he deleted a hard drive full of the music he'd been working on, which he says helped send his sound in a new direction. "I was making this kind of music called future funk. I thought I was kind of being too narrow, but I thought 'I like the tempo. Let's just work at this tempo and go crazy'." The pioneer also reflected on how dubstep has changed since the release of his breakthrough album, Diary of an Afro Warrior, 10 years ago. "I still love the music. I go back to certain tracks and think to myself 'wow'. "As far as where it's gone, I respect everyone that's still grinding to take it in new directions, but I can only now do Benga music." Visit the BBC Advice pages for information on coping with mental health conditions.